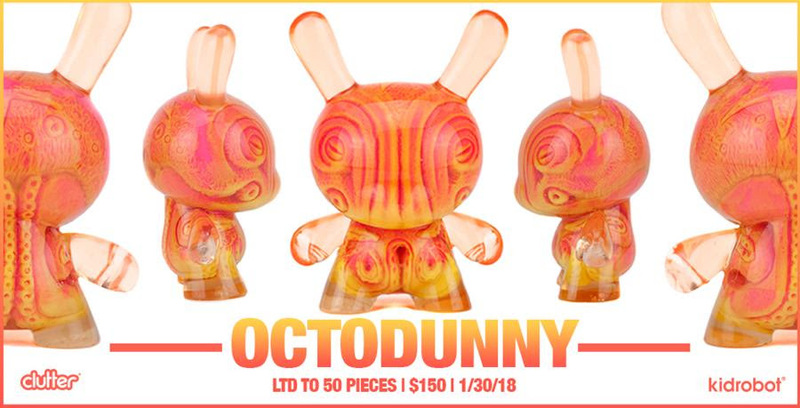 After emerging from the darkest oceans, night has passed and the Sunrise OctoDunny has risen! Clutter is excited to announce the release of the latest colorway of OctoDunny - Sunrise! Officially licensed with our friends at Kidrobot, this 5" Dunny is a triple cast, hand-pulled, resin piece of art, that will shine in your collection! Hand-sculpted by artist Josh Kimberg (@AmericanGross), the internal Octo "Taku Taku" is cast in a gossamer fluorescent yellow and fluorescent pink swirl, with an external orange-tinted Dunny skin! Each of these pieces are lovingly hand-created in New York by Clutter Studios!! Priced at just $150 apiece this release is limited to 50 pieces worldwide! Ending January with a bang, these will be dropping on shop.cluttermagazine.com, Wed, Jan 31st, at 12 (noon) EST. These cute OctoDunnys are sure to make a splash in your collection!